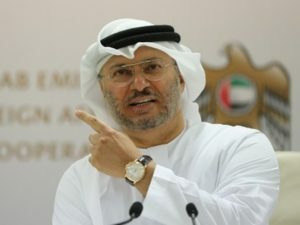 UAE’s minister of State for Foreign Affairs Anwar Gargash brushed aside claims by the Qatari Emir, Sheikh Tamim Bin Hamad Al Thani, that his country, currently locked up in a diplomatic row with neighbors, is keen to enter into dialogue only if Saudi Arabia, UAE, Bahrain and Egypt stop interfering in its internal affairs. Speaking at Doha Forum late last week, Sheikh Tamim said Qatar was willing to participate in dialogue only if there was non-interference in its internal affairs. The tiny Gulf country has been facing since June last year a sea/air/land blockade imposed by the Saudi-led quartet, which accused the Gulf Cooperation Council (GCC) member of supporting terrorism and Iran, the archenemy of the regional bloc. Taking to Twitter, Gargash tossed to the bin the Qatari ruler’s accusation noting that it is rather Qatar, which interferes in the internal affairs of other countries of the region. “This bears the fingerprints of the former emir, and in short, we will not see a fundamental change that allows the young leadership to manage things realistically,” Gargash tweeted. The Emirati top diplomat also slammed Qatar for using Turkey to irk Saudi Arabia. Qatar “deepened its crisis of malicious targeting against Saudi Arabia recently” and played the “role of inciting Riyadh with Turkey in the Western circles and international organizations”. Ties between Doha and Ankara moved to next level after Turkey enabled Qatar to circumvent the blockade. Gargash also noted that Qatar’s attempts to find solutions through Western capitals “have not succeeded and were not in themselves a convincing policy”. “However, Doha, under Turkish and Iranian protection, continues to work in the same desperate pattern,” he said adding that the 18-month diplomat crisis will not end any time soon. “The measures taken by the four countries aim to prevent the country’s political and sovereign interventions and to change the country’s destructive trend, and we realize that Doha will return to its senses and its Gulf surroundings in a timely manner,” he said. Written by: KanelkaTagba on December 17, 2018. Posted by KanelkaTagba on Dec 17 2018. Filed under Gulf News, Headlines. You can follow any responses to this entry through the RSS 2.0. Both comments and pings are currently closed.